Since the end of April, just before the Eurozone sovereign debt crisis started heating up, the dollar has risen against other major currencies by about 10% (see top chart above). A stronger dollar is always good news, in my opinion, since the strength of the dollar is a significant part of our standard of living and reflects importantly on the overall health and viability of our economy. But most of the dollar's gains this year have come at the expense of the confidence-weakened euro, and that's hardly a ringing endorsement of the dollar. 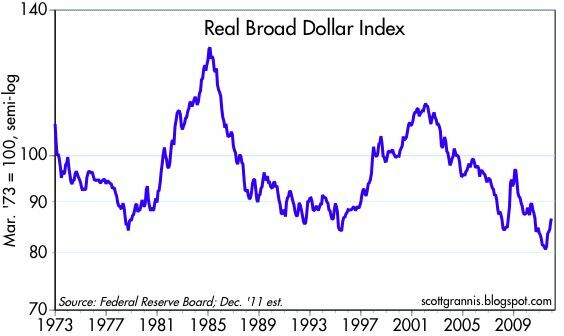 As the second chart above shows, the real value of the dollar (adjusted for relative inflation differentials) is still very low from an historical perspective; by my estimates, the dollar today is only about 7.5% above its recent all-time low against a large basket of currencies. 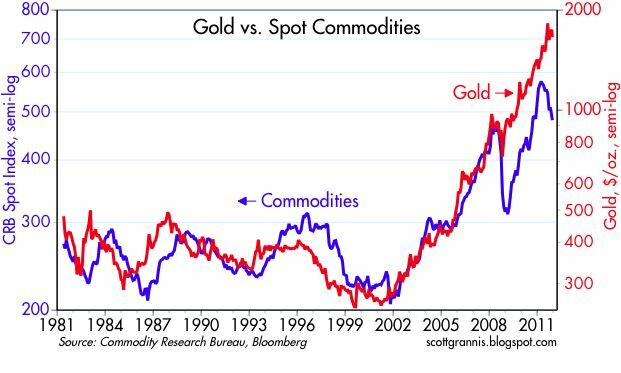 Measuring the value of the dollar against other commodities is certainly a useful exercise, but it also helps to know how the dollar is faring against things (e.g., gold, commodities, energy, real estate). On that score the dollar also is not doing very well. 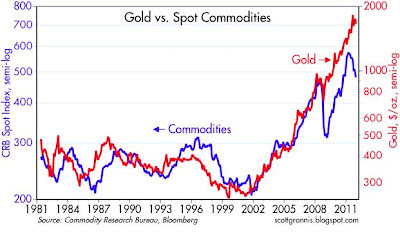 As the first two charts above show, the dollar has lost considerable ground against gold, commodities and oil, though it recently has recovered a portion of what it lost in the past 10 years. Relative to real estate (third chart), the dollar has done much better, only losing a fraction of its value against home prices, and hardly any of its value against commercial real estate prices. 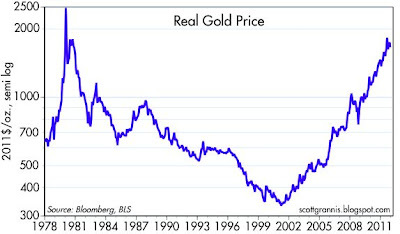 The fourth chart shows the real price of gold, which is still shy of the peak it briefly reached in early 1980. Overall, the dollar looks pretty weak, with the notable exception of real property. That suggests that if you're looking for some way to hedge against a further decline of the dollar's value, buying real estate (and possibly leveraging it with a record-low fixed rate mortgage) might be the best candidate. Selling the dollar against other currencies is a risky proposition, given that it is close to its all-time lows, and as the second chart at the top suggests, there is likely to be some support at these levels. The chart above suggests that the dollar is very undervalued relative to the Aussie dollar, and that is a reflection of how important commodity prices—which are close to record highs against the dollar—are to the Australian economy. 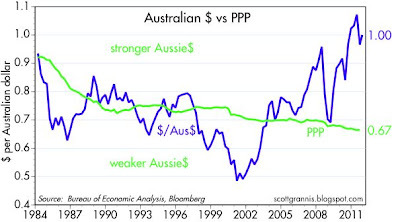 If commodities were to weaken further, the Aussie dollar would probably follow suit. I guess I will never fret about a lower exchange rate for the US dollar. I see only positives---better export markets, more tourists here, less US tourists abroad. More investors for USA real estate and productive facilities. US manufacturing, as noted by Dr. Perry, seems to be in a boom. Bring to me such bad news every day. The US dollar is not much lower than it was in the 1979s and then 1990s. Now, Japan has "enjoyed" a strong yen since 1992. Yet Japan's economy is suffering from deflation, with equity and real estate markets off by 80 percent since1992. Japan is scouring SE Asia for manufacturing platforms. Amazingly, in nominal terms Japan's economy is smaller today than in 1992, though it may be slightly larger in real terms, depending on how you want to calculate deflation. We may see an American manufacturing and energy boom in years ahead, and one can hope for a real estate surge as well. 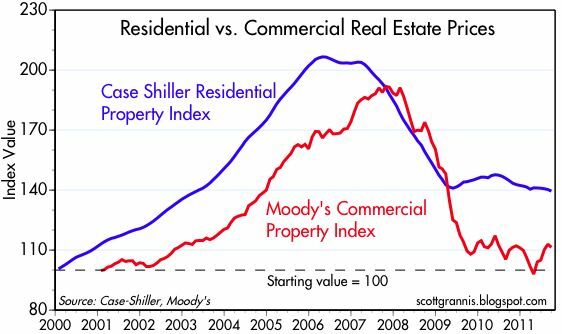 I agree with Scott Grannis on this: Real estate prices are at record lows; housing has never been more affordable. If the Fed stops asphyxiating our economy, we could see a secular boom for decades. Bring it on, Mr Bernanke. The Dow got creamed today, when the market realized the "Do Nothing" Fed is still in charge. Jim Cramer said we're at "Defcon 2" because the Euro has fallen below $1.30. Do you agree that this could be a flash point for the markets? 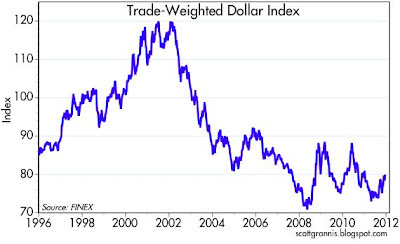 Weaker dollar is very consistent with American economic activity (slow growth) and is exactly what this country needs. Shifts consumption towards domestic production and away from exports. Makes our labor more competitive, and as a debtor nation eases the burden of Uncle Sam. The strong dollar's of the 80's and 90's was an exorbitant privilege, to borrow a phrase. Agree with Benjamin's comment about Japan's enjoyment of the strong Yen. IT has crippled their exports. A weak dollar is Just what the doctor ordered. Why is a strong dollar ALWAYS good news?? You have been watching Kudlow too long. See Benjamin (above) for the disadvantages of a too-strong currency. I think Larry Burkett has the best ever simple description of money in Your Finances in Changing Times (1975). He uses nails as money in his illustration and goes through the formation of currency all the way though bank falures in his brief example. In his illustration he states that money must have three characteristics: 1) storable (milk would be bad money), 2) divisible, and 3) maintains value. When you rapidly reduce the value of money as the world governments have done since 2002, people will look for a different place to store their wealth. First, they tried housing, now gold. 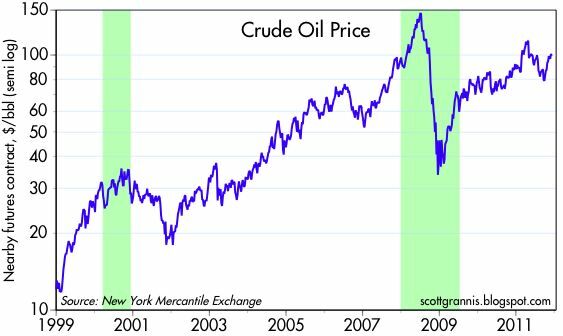 I agree with Scott, when the money you have can buy more stuff (strong dollar), this is good. Explain that to the Japanese. Per capita, in 1995 the Japanese had about 80 percent of the purchasing power of Americans. Now it is about 70 percent probably less. The yen is very strong. But Japan's economy, since 1992, has retreated relative the the USA. Meanwhile, had you owned Japan stocks or real estate in 1992, you would now be down 80 percent. The Japan story suggest a strong currency is strong only in name--it is weak when it comes to creating true wealth for citizens. Re: the euro. Even at 1.30 the euro is pretty strong relative to the dollar. The euro has averaged 1.20 since its inception. So I don't know what is terrifying about the euro falling below 1.30. If anything it just means that the likelihood of a inflationary "bailout" of the PIIGS seems more likely. While you love the Japanese example to make you case, why don’t you use the Swiss? The currencies of both countries relative to the dollar have increased sharply since this day in 1995. That is where the similarities end. In 1995, per capita GDP for Switzerland was $44,871, for Japan was $41,968, and for the U.S. was $27,559. In 2010, Japan had slightly increased to $43,137 while Switzerland had increased sharply to $66,934 and the U.S. had increased to $47,184. Data. The real question is why have the Japanese done so much worse than the U.S. and Switzerland? Perhaps a more likely explanation is around the economic freedom of the three countries. In 1995, the economic freedom index of all three countries was basically even. Since then, the Japanese have consistently had a less free economy that the U.S. and Switzerland. Fifteen years of lower economic freedom result in lower per capita GDP. The gold price run up looks similar to that of the most recent internet and housing bubbles. It won't continue in a straight line upward trajectory forever. There's a lot of money that can flood into the stock market when the gold bubble bursts.